The specific soil organisms that partner with and help 90% of all plants and extend the root systems of the plant up to 2,500 times what the plant could reach by itself, won’t survive the winter unless they have living roots. Although they multiply in the garden sooner or later in the growing season, it’s beneficial to have them already active first thing in the spring to get plants off to a better start. After all, it’s NOT the roots of the plant, but these special fungi that are responsible for most nutrient uptake by the plants. Although information on these fungi has recently become popular with garden publications and websites, soil scientists have known about them for decades or longer. As with anything that becomes popular, someone will be selling something. In this case it’s inoculants of mycorrhizal fungi. Just keep in mind that you don’t really need inoculants. It’s pretty easy to maintain the native communities of these fungi in your garden. The things that I have in my garden to harbor mycorrhizal fungi in the winter and allow them to colonize earlier in the spring are asparagus, blueberry bushes, various perennial or biennial herbs (rosemary, thyme, oregano, parsley, cutting celery), strawberries, bunching onions, garlic, and over wintering lettuce, chard, and other greens. And there are (or will be) a variety of cover crops: winter rye, oats, field peas, alfalfa and white clover. I even have some perennial flowers such as daylilies, echinacea, baptisia, phlox, and asters at the end of various rows. 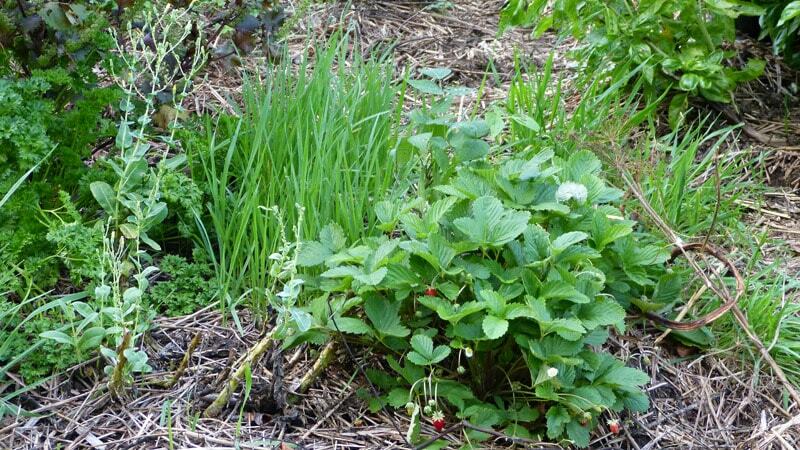 Parsley, oats, and strawberries are a few of the plants that will give shelter to mycorrhizal fungi in the winter. Field peas, oats and blueberry bushes will also harbor these beneficial fungi during the winter. Think about what you can plant to encourage the “friends” that nature has put in your soil to help your garden be successful. Once you’re walking in step with nature you’ll be amazed at the increase in your garden’s yields and the decrease in diseases and pests. It might take some time and patience, but basically all you have to do is make the effort. Nature will do the rest. Thanks for revisiting this subject again Theresa. It’s new to me. What you suggest doing makes perfect sense and is so easy to do. Thank you. This is great information. I live in a subdivision with a home owners association. Which of the ground covers you use are the nicest looking? I want to try a ground cover in my front garden beds. I have to make it look nice. Thank you. Sandra, I felt it needed revisiting because it is such a new concept to many that I don’t think all readers were really “getting it.” It’s such an important piece of information and one we can use to help us in our garden in many ways. I’ll address it from a different angle in letter to the 100 group soon. Sue, I gave your question some thought. The thing that made me hesitate was that what looks nice is in the eyes of the beholder. My garden looks wonderful to me, but would probably make members of your home owners association pass out with horror. At first I thought of clover (white clover) – but maybe even that is a bit much for the home owners group. And then it occurred to me that the wild strawberries (like in one of the pictures I included in the post) might be just the thing. They are easily raised from seed and the foliage is lovely. (I’m basing that only on one year, since I raised these from seed this spring.) They grow more quickly than regular strawberries and I’ve been delighted so far with mine. I’m growing all 4 varieties and from what I can tell thus far, they are all doing very well and I can’t tell any difference in the leaf. All look good. Hope this will be helpful. If I think of anything else I’ll let you know. I’d be interested in knowing what you end up using and how it works. Good hearing from you Sue. It’s been a while. I have a pow of purple flowers, called turtle something instead of lattice on the edge of my deck. The flowers come up every year, so I’m quite sure the roots are living, but dormant. They come up every year with new shoots. The same for my miniature roses alongside my garage. We get too much snow for much to grow in the winter except trees and some bushes. Don, I think those plants will probably harbor the fungi just fine. The only plants I know about that don’t need these fungi for partners are beets, spinach, and most members of the mustard family (includes broccoli, Brussel sprouts, cauliflower, collard greens, kale and radishes). I have not heard of any others. Even though your garden is relatively small you could still put small spots of winter rye or dormant alfalfa to keep the colonies of fungi alive and well. A small strip of alfalfa all around the edge of the garden would do the trick too and would be easy to keep cut in the spring.